This is a list of Conference Roll of Preachers in the Western Ontario Conference in order of their conference admission starting from 1896 to 1944. The following pages will contain biographical details of each preacher and his pastoral career within the Western Ontario Conference. Check back often as this site will be added to frequently. If you have a memory of or a fact about any of the preachers on this list, please contact us! Thanks for visiting! Born 23 November 1858 in King Township, York County, Ontario, Welsey Charles Walls was converted in the Methodist Church and was re-claimed from a backslidden state under the labours of Miss Valtina Brown, an evangelist of the Free Methodist Church. A short time after this he was sent to supply a new field in the back woods of Muskoka, Ontario. He had quite a revival on this his first charge which proved to be the nucleus of the Huntsville circuit which later grew to have three church buildings and a parsonage. Rev. W.C. Walls married Mary Alice Loveless on 23 November 1881. Together they had seven children. Mary Alice died in January 1899. Rev. W.C. Walls married Miss Annie Robertson on 21 March 1900. Rev. W.C. 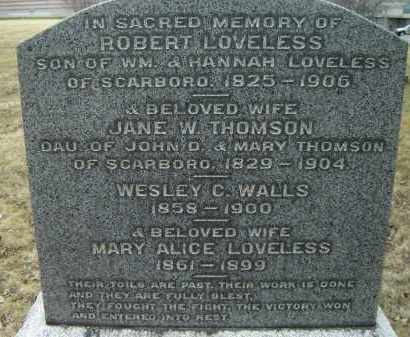 Walls died of asthma and pneumonia on 23 June 1900 in Brantford, Ontario. He was laid to rest in Armadale Free Methodist Cemetery on 25 June 1900 by Rev. James Craig. 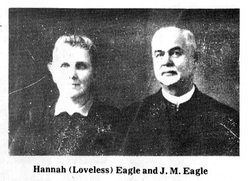 Born 29 December 1864, Rev. 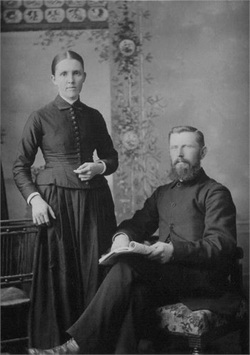 John Malcolm Eagle was officially admitted to the Western Ontario Conference of the Free Methodist Church in 1896. He died 10 July 1936 and was laid to rest in the Hannon Free Methodist Church Cemetery. Check back in the spring for more details about Rev. Eagle's dedicated contribution to the work of the conference.